It makes me wonder whether local realtors are pissed with him and the paper, given that they spend megabucks each week on space ads. Of course, maybe this was a safe way out, as he’s avoided choosing one realtor over the others… and the paper can claim innocence since he’s no longer an employee. As my dear wife pointed out to me, I’m in a similar situation, in that I have two local clients who are also realtors. Are they pissed at me? In a related development, Edina Realty has announced in both the Strib and the Northfield News that they no longer are using the papers’ classified ads section to list their open houses. They’re only available online, although I see that invidual space ads in today’s paper still mention them. BTW, when we sell our house, we’re probably going to need an attorney to dot the i’s and cross the t’s on the paperwork. I’m not interested in a comission arrangement, eg, 1% of the sales price, but rather just paying the hourly rate to do what needs to be done, “Slam bam thank you Ma’am.” If there are any legal beagles out there reading this who are interested, contact us. 1/18 update: Seez evidently has not yet retired, as he has a column in the 1/17 edition. I’ve done strike-throughs on the text above. As a Realtor here in Northfield, I just had to respond! I took a careful look at your house-for-sale blog. You have a very nice house and you include a tremendous amount of information. Your flyer is very nice, especially the photos. I would suggest listing the room dimensions rather than the square footage. Most people have a hard time picturing 225 square feet; it’s easier to “see” 15’x15′. Regarding Louie, you’re right. I found it most hypocritical that he would sit here in our office asking us to spend tens of thousands of dollars on advertizing in his paper while he was blatently selling his own properties without a realtor. 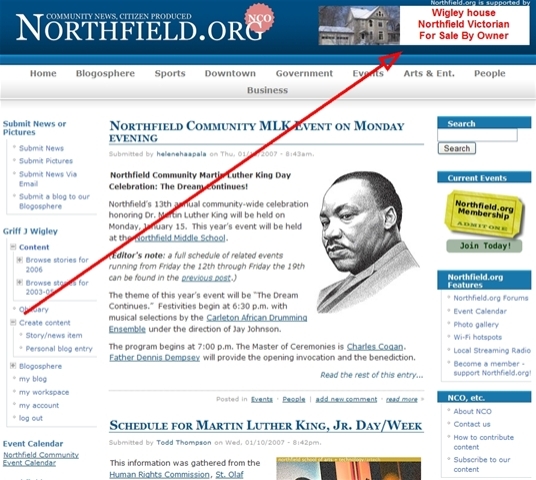 I often wondered what would happen to the Northfield News if the real estate offices in Northfield decided not to advertize. I would welcome the opportunity to discuss the progress you’ve made in getting your house sold. I would also enjoy speaking to you about the costs and benefits of using a realtor to sell your house. With the market being as tight as it is, I would think you might give us serious consideration. P.S. Include the address of your property on your blog so people know where to find it. Thanks for the comment and feedback, Kathryn. I’ll take a close look at what you emailed me. I snipped out one paragraph of your comment. I’ll email you an explanation.